These two books, about very different historical figures in church history, share certain characteristics. The authors have impressive academic and professional accomplishments but write in a manner that is accessible to the general reader. Both books provide excellent introductions to the writings and the theological and historical context of significant Christian thinkers. They suggest ways for how we can appropriate the insights (D’Ambrosio) and methods (Dreyer) of doing theology. And both books model respect and gratitude for tradition. Dreyer studies four women doctors of the church — Sts. Hildegard of Bingen, Catherine of Siena, Teresa of Avila and Therese of Lisieux. “Without formal theological education, these four women relied more heavily on the promptings of the Holy Spirit, their innate intelligence, and their individual and communal experience,” she writes. Although they lived in radically different times, Dreyer finds striking similarities in the theological themes of these four women. They offer us an incarnational, prophetic spirituality that has deep resonance with our contemporary Christian anthropology. In exploring their teachings on sin, suffering and self-knowledge she suggests ways we can channel our own theological reflection. These women left a legacy that is particularly valuable today, when the work of theology — particularly by women theologians — is called into question by some members of the hierarchy. “Their incredibly strong wills and perseverance in spite of difficulty are based on their theology of God as magnanimous lover and giver of grace, and on their positive Christian anthropology,” Dreyer writes. 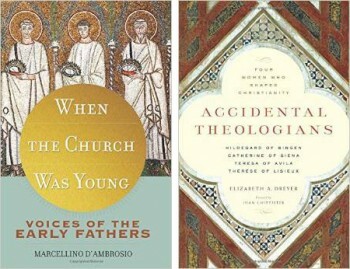 “When the Church Was Young” is an engaging introduction to the early church fathers. D’Ambrosio has an extraordinary command of the history he writes about, the period from A.D. 100 to 800. In D’Ambrosio’s skilled hands we watch the development of doctrine, not through abstract thought, but in the heat of theological, political and regional conflicts. Orthodoxy was defined against the excesses of heresy, but so was a theology of liturgy, structures of authority, and the selection of what to include in the scriptural canon. They were passionate men, not a few prone to anger and impatience but, under the guidance of the Holy Spirit, they crafted a theology and church polity of wise moderation. These writings are part of the shared patrimony of both Eastern and Western Christianity and D’Ambrosio’s book is appropriate for this time, when ecumenical relationships are characterized by respect rather than enmity. But above all it is a hopeful reminder that ours is not the only century to face theological conflict and division or the opposition of society. Moreover, we can address these challenges with the gift of tradition, the lives, witness, and teachings of the holy men and women we meet in these two books. Coming in 2015: “The Ancient Path: Old Lessons From the Church Fathers for a New Life Today” by John Michael Talbot with Mike Aquilina. Image Books (New York, 2015). 208 pp., $22.